Oils have long been used for maintaining hydrated skin. They are a natural way to restore moisture to the surface of the body, promoting health skin and a shiny coat. 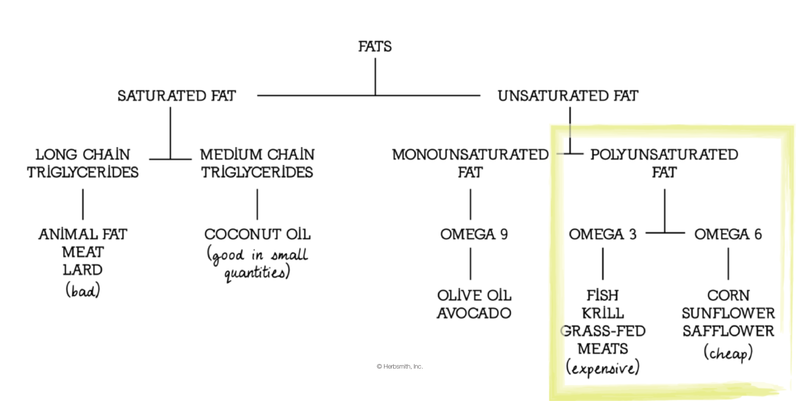 Oils are derived from fats, which have a complex family tree. Saturated fats break off into long-chain and medium-chain triglycerides (and are generally bad for you in large amounts). Beneath long-chain are the “bad” fats – the ones that really aren’t good for you. Coconut oil comes from the medium chain triglycerides and is one of the few types of saturated fats that can be good for the body. Unsaturated fats (the good kind of fat) split off into monunsaturated and polyunsaturated. Beneath the polyunsaturated, you’ll find the Omega 3 and Omega 6 Fatty Acids. Both Omega 3 and Omega 6 fatty acids are essential to the health and wellness of our pets. Especially for dogs prone to allergies or dry skin, these two essential nutrients can make all the difference in soothing and healing itchiness. Both are great for supplementing your pet’s diet, but they do play different roles in the body. While both are chained carbon molecules linked with a double bond, what differentiates them is where that double bond is located on the chain. Omega 3 is at the third carbon, while Omega 6 is at the sixth (which is where the names came from!). For optimal health, there is a recommended ratio of Omega-6 fatty acids to Omega-3 fatty acids (current recommendations are for 10:1 to 5:1 respectively). Because these two nutrients share a common enzymatic breakdown process, it’s important to balance the intake of both based on these ratios. Omega 6s are often readily available because they are cheaper, but the one type of Omega 6 dogs need (and can’t manufacture on their own) is gamma-linolenic acid, or GLA. A fatty acid chock-full of health benefits, GLA is present in borage oil and evening primrose oil. Omega 3s are less likely to be in adequate quantities in pet foods simply because they are more expensive. Salmon and anchovy oil, krill, and grass fed meats are the best sources for a carnivore because they provide the active forms of Omega 3 (EPA and DHA) directly, rather than the inactive (ALA) that needs to be converted first. As an inactive form, ALA cannot be utilized by the body unless it gets converted into one of its active forms. And because dogs are carnivores, the lack the proper enzymes to effectively convert ALA as could an herbivore or omnivore. This is why it’s so essential that we give our pets natural sources of the already-converted forms of Omega 3s. Contains essential Omega 3 and Omega 6 fatty acids (EPA, DHA, and GLA) for healthy skin and a glossy coat in dogs. Rich in omega fatty acids, Glimmer helps to support skin and coat health. 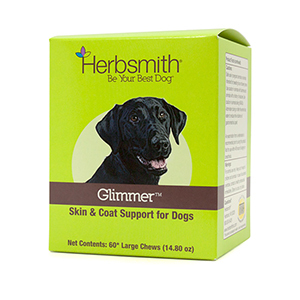 With EPA, DHA, and GLA, Glimmer maintains the skin’s normal moisture content and may help to maintain normal, seasonal shedding. It may also lend extra support during allergy season.